Wait a minute! Did Jesus just call this woman a dog? Does this sound like the Jesus we know and love? We have lots to talk about this Sunday! I still get overwhelmed at the grocery store. By aisle upon aisle of food. And stuff. So much stuff. Take the bread aisle. White bread. Wheat bread. French bread. Rye bread. Sourdough bread. Dave’s Killer bread. And like 17 varieties of each. And Kalamata olive bread. And gluten free bread. And Hamburger buns, hot dog buns, tortillas, flat bread, naan, focaccia. I’m sure I’m missing some more! SO. MUCH. BREAD. When Jesus says, I am the Bread of life, I think it falls a little flat on our ears. Big deal. Most of us are not desperate for bread. We have choices. Many of us are going with a more low carb diet, trying to cut out bread! Bread? Ho hum. But for the crowd that followed Jesus, bread was a basic ingredient of life, an essential, the essence of survival. When Jesus said, “I am the Bread of life” he meant “I am what you need to survive, to really live. Forever.” We sorta tune out, but they were all ears. “Give us this bread!” they say. 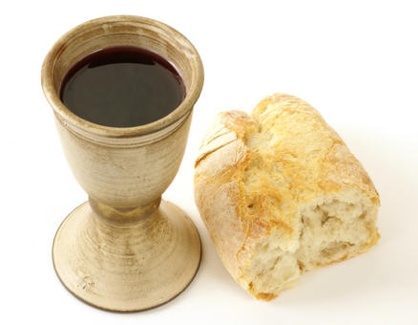 This week in the text from John 6:51-58, Jesus says, “The bread that I give for the life of the world is my flesh” (verse 51), and “unless you eat the flesh of the Son of Man and drink his blood, you have no life in you” (verse 54). Jesus pretty much stays in this flesh and blood mode for this entire passage. Enough to cause some tension. With these graphic words he’s starting to lose them. I admit, it does sound a bit weird, doesn’t it? There’s a definite “ew” factor here. So what is Jesus talking about? Or, maybe more importantly, what is Jesus promising us, or what is Jesus inviting us to? Looking forward to sharing the good news with you in worship! Bring your appetite! What a trip! Epic! Trip of a lifetime. Everything I hoped for and then some. IMAGINE SIX WEEKS AWAY. 42 days. On the water. 722 nautical miles total. On a very small boat (25” long). On a very large body of water. Talk about getting perspective! Whew! One person’s prayer for me as we departed touched me deeply: “I'm picturing you out on the water, brave and adventurous, seeing God everywhere!” And it happened! I did things I didn’t think I could do. And God was revealed again and again in the stunning beauty of creation, and in the exquisite stories of ordinary-extraordinary human beings we encountered along the way. All I had to do was pay attention! But it will be good to be with God’s people on Sunday, worshipping God and reading Scripture together in community again – one of my most very favorite things to do! Looks like you all have been hanging out in John 6 (which begins with Jesus feeding the 5,000), and we will do so a bit longer – this week in John 6:35, 41-51. Check out the text: I’m wondering why people are starting to get all bent out of shape when Jesus says he is the “bread that came down from heaven”? And then when Jesus says, “I am the Living Bread” – I realize sometimes I kind of wish he would’ve said something more like, I am the banana split of life, or the old fashioned glazed donut of life! I wonder, What am I really hungry for? What are you hungry for? What do we want? And what do we need? Looking forward to sharing with you in worship! I hope you are enjoying the cool down as much as I am. While I love the heat, the coolness of the day allows me a time to recharge, slow down a bit, and relax. God knows when we need a break and he offers it to us in many ways. Sometimes we recognize it, give thanks and are able to redirect our focus to the one who gives us life and other times we are so caught up in the business of the day that we miss it. Sunday worship often becomes the only time where we hit the pause button. I encourage you to pause today, just for a moment, and look around at God’s creation, receive His peace, and be assured His grace is shining on you. I hope you are all finding ways to enjoy this summer. I heard a report that Seattle is the most under-air-conditioned major city in the country, so staying cool can be a challenge. I can picture the five thousand plus people, who are in the passage this week that came to see Jesus, were probably really hot with that many people all crowded together. Even with the grassy field, it was still probably not comfortable. I have trouble imagining why they would stay. Conversations this week helped affirm the reason they chose to stay. Hope. Jesus brought hope to the many then as he brings hope to us today. I heard it this week through friends who are struggling with family issues, I heard from folks in the shelter who are working toward a more stable life, I heard it through strangers just needing to share with someone. Jesus gives us hope. Don’t’ be afraid to share that with someone, because we all need a little assurance that things will be alright. Sunday, Pastor Ed Park joins us again to lead us through John 6:1-21. Jesus tells his disciples to feed the five thousand plus he walks on water! Take a look at this story with new eyes. I hope you are enjoying the cooler weather and are able relax and enjoy the day. Heidi and Rick are now on their way, slowly coming back down from Canada. They are still talking to each other and enjoying a well deserved time to relax. I know we will hear a lot of stories from both of them when they return. This Sunday, I’d like to invite any and all who would like to join me for a walk about through Freeway Park; just a stroll to take in the beauty of our neighborhood and to continue our fellowship after lunch. This Sunday Rev. J.P. Kang returns to join us and will be leading us through Mark 6:30-34, 53-56. We had some interesting reflections with our friends at Compass @ First Pres last Wednesday as we explored these passages. I look forward to hearing Pastor J.P. and your reflections this Sunday. God brings us into relationship with others at the right time for His purpose. As I looked round the congregation last Sunday, I realized the larger impact that the Compass shelter in the basement had on our church. We needed the shelter as much as they needed us. There were 7 current or former guests from the shelter, some new to us and some who have come to think of First Pres as their community. The Sister Sledge song, “We are Family” came to mind; all our brothers and sisters in Christ coming together to worship, to connect, to be reminded that God loves us and we are not alone. I encourage you this Sunday to meet someone new, whether they are a guest in the shelter or just someone coming in off the street. Listen to their stories; they are full of the grace and mercy of God. And if you’d like to join us for Bible study on Wednesdays at the shelter, you’ll learn our stories are not that different. While Pastor Heidi is away this summer, we have several other pastors filling in for the sermon time together. This Sunday Pastor Ed Park from Sanctuary Church will be leading us through Mark 6:14-29. Promises, regret, and John the Baptist’s head on a plate. If reading scripture seems a little boring at times, take a look at this one and you might be changing your mind. This eNews is coming a little early this week due to a change in staff schedules: EJ Lee, Director of Operations in the Presbytery office, faithfully sends out the eNews every week, and she is headed to St. Louis tomorrow to help support our Presbytery Associate Executive, Eliana Maxim, who is standing for Co-Moderator of our General Assembly – which is a pretty big deal! (We’ve been blessed to have Eliana preach a couple times in the past at First Presbyterian, and we’re delighted she will do so again on July 1). The General Assembly votes to elect new Co-Moderators this Saturday night. Go Eliana! Also, the sermon text for Sunday is Mark 4:26-34. In Mark 4 Jesus is speaking in parables about the Kingdom (Kin-dom) of God. Parables are pithy, super short stories… Jesus says the Kin-dom of God is like a seed that grows all on its own… Or, the Kin-dom of God is like a mustard seed, the smallest of seeds that grows into a massive bush… Pretty simple stuff, right? So I wonder then why did Jesus have to “explain everything in private to his disciples” (verse 34)?! I imagine this Sunday we’ll be scratching our heads a bit together and wondering about what the heck Jesus is trying to tell us about the reign of God! I’m still in Pennsylvania for the Church Planting and Revitalization Initiative I started this week at Pittsburg Theological Seminary. I catch a flight home Saturday evening, and will see you all on Sunday, perhaps a bit bleary-eyed, but so grateful for the things I am learning – not the least of which is there is no quick fix for church decline; there is no silver bullet to renew a congregation. We can only seek God, listen for and discern God’s direction, trusting God together. I wanted to make sure to send you the sermon text for Sunday – Mark 3:20-35 – where everybody thinks Jesus is going bonkers, even his own family – which actually causes Jesus to take the bold step of redefining family. I wonder what you think about that? Check it out! Several months ago I heard about a year long program of study at Pittsburg Theological Seminary (PCUSA) called “The Church Planting and Revitalization” Initiative – and it captured my interest. So I put together my application…and got accepted…and next week I head to Pittsburg for the first of five 4 day intensives (1 other meets in Pittsburg, 1 in Minneapolis, 1 in Denver, and 1 in San Francisco over the next 12 months). I’ve been reading books, thinking deep thoughts and writing papers like crazy, and loving it! I look forward to sharing with you along the way, and seeing what ideas this generates! Last Sunday on Pentecost we celebrated the gift of the Holy Spirit – the Advocate who comes to both comfort us and make us uncomfortable. Pentecost is revolutionary; it brings a great equalizing. The Spirit is still at work in the church and world, breaking down barriers, forming a new multi-cultural community. So why not preach on the Trinity this Sunday? Lose says, “Because it’s a doctrine”… and “a confusing doctrine…” at that! For many people it has become “little more than a formula” that doesn’t really mean anything. The problem is, when we describe God formulaically, as Father, Son and Holy Spirit, it gets so confusing or clinical sounding that what we often lose sight of is…the loving God of the Bible! Interestingly, the very thing the Lectionary seems to want to help us remember this week is…the loving God of the Bible! Read through the sermon text from John 3:1-17 a couple times. We’ll meet a guy named Nicodemus, who has some questions for Jesus. Notice how the ensuing conversation gets a little confusing. But also notice we end up with probably the most famous verse in the whole Bible – John 3:16 – “God so loved the world…” Yep, we’ll end up with love. After the risen Christ left this earth, the disciples were told to wait for the promised Holy Spirit who would empower them for ministry. Before long things got pretty wild as the Holy Spirit arrived as a violent wind and tongues of fire, and the Holy Spirit them gave the disciples the ability to speak in other languages – so that all the people gathered in Jerusalem could hear the good news about Jesus in their own language! In our sermon text from John 15:26-27; 16:4b-15 Jesus makes a big deal about sending the Holy Spirit after he’s gone, and calls the Holy Spirit “the Advocate”, or sometimes it’s translated “Comforter.” That’s a good thing, right? – the Holy Spirit is Comforter. Unless maybe we get too comfy? Read back through Acts 2 and you get the sense Pentecost is not very comfortable. In fact, I don’t think it’s too farfetched to call Pentecost totally revolutionary. The Spirit was, and still is, shaking things up bigtime. P.S. Celebrate Pentecost this Sunday by wearing a fiery color – red, orange, yellow – or all of the above – underscoring the fact that today we Presbyterians are still figuring out how to get our Pentecost on! That’s straight from our sermon text this Sunday – John 15:9-17 – if you want to give it a slow read. And how does that even sit with you – a command to love? Can you make people love? Especially as Jesus loved? I mean the bar is set pretty high, no? I think this would all feel very heavy and burdensome, except the text is loaded with all kinds of good news, as well – though not always easy for us to detect. Still, it’s kind of like Jesus works overtime here not only to help us take the command to love seriously, but also to help us not freak out, too… I absolutely love some of the good news images and words of assurance in our text this week. Come and let’s dig around together – I think you’ll love them, too! Here’s a quick update about the FPCS Litigation: We received word this week that the Washington State Supreme Court has declined to hear the court case appeal, deciding instead to transfer it to Division I of the State Court of Appeals – which must uphold the Rohrbaugh decision/precedent (as the King County Superior Court decisions have already done). We will know more about the court timeline in coming weeks. Our sermon text this Sunday is John 15:1-18, where Jesus says “I am the vine, you are the branches…abide in me.” In fact, check it out – and you’ll see the word “abide” is repeated no less than 8 times in as many verses. You think maybe Jesus is trying to tell us something? 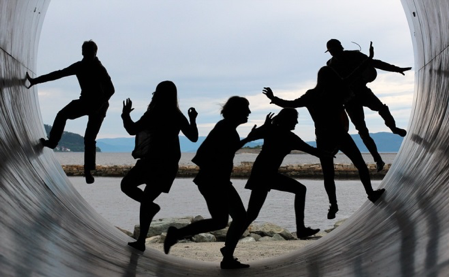 Have you ever felt like an outsider, like you didn’t belong, like you were different, or “other”? How many of us had the horrible experience as a kid in elementary school out on the playground during recess, with two popular classmates choosing up teams, and dying in a pile wondering if we’d ever get picked! I was always tall for my age, and skinny as a bean-pole, with firey-red curly hair, and super shy (I know, hard to believe!) – and most days I never quite felt like I fit in. Even as a late-comer to Christian faith and the church, though I was warmly welcomed, sometimes I felt like I didn’t really belong. Every so often I still feel “other” in the church! So there’s a curious thing in our sermon text this week that I absolutely love. 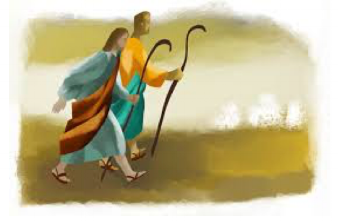 Jesus is the Good Shepherd who says, “I have other sheep that do not belong to this fold. I must bring them also…” I love that Jesus values “otherness.” I love that Jesus values inclusiveness. It’s so…well, good shepherd-y! Usually we say the others that Jesus meant here were the Gentiles (as opposed to the Jewish Pharisees with whom Jesus was talking). But could there be other others? I hope you get a chance to take a look at John 10:11-18 – and bring your questions and insights to share as we engage the text together this Sunday!